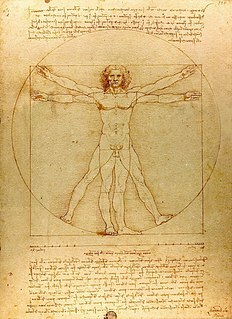 Drawing is a form of visual art in which a person uses various drawing instruments to mark paper or another two-dimensional medium. Instruments include graphite pencils, pen and ink, various kinds of paints, inked brushes, colored pencils, crayons, charcoal, chalk, pastels, various kinds of erasers, markers, styluses, and various metals. Digital drawing is the act of using a computer to draw. Common methods of digital drawing include a stylus or finger on a touchscreen device, stylus- or finger-to-touchpad, or in some cases, a mouse. There are many digital art programs and devices. Boston Expressionism was a school of painting that originated in Boston, Massachusetts, in the 1930s and flourished through the 1950s. Strongly influenced by German Expressionism and by the Jewish immigrant experience, it is marked by emotional directness, dark humor, social and spiritual themes, and a tendency toward figuration. The painters' technique was distinctive, employing bold color and expressive brushwork, and they often experimented with unusual media such as encaustic. The School of the Museum of Fine Arts at Tufts University is one of the schools that Tufts University comprises, located in Boston, Massachusetts. The school offers undergraduate and graduate degrees dedicated to the visual arts. It is affiliated with the Museum of Fine Arts. SMFA is also a member of the Association of Independent Colleges of Art and Design (AICAD), a consortium of several dozen leading art schools in the United States. The Boston Public Library McKim Building in Copley Square contains the library's research collection, exhibition rooms and administrative offices. When it opened in 1895, the new Boston Public Library was proclaimed a "palace for the people." The building includes lavish decorations, a children's room, and a central courtyard surrounded by an arcaded gallery in the manner of a Renaissance cloister. The library regularly displays its rare works, often in exhibits that will combine works on paper, rare books, and works of art. Several galleries in the third floor of the McKim building are maintained for exhibits. Danforth Art is a museum and school in Framingham, Massachusetts. Established as a grassroots organization in 1975 by a committed group of community activists, business owners, educators, and artists, it invites visitors to see, learn about, create, and be inspired by art. Danforth Art educates the public through its permanent collection of American art from the 19th century to the present day, changing exhibitions of contemporary artists, studio art classes and workshops, and a variety of community outreach programs. The Fitchburg Art Museum is a regional art museum based in Fitchburg, Worcester County, Massachusetts, United States. DeCordova Sculpture Park and Museum is a 30-acre sculpture park and contemporary art museum on the shore of Flint's Pond in Lincoln, Massachusetts. Established in 1950, it is the largest park of its kind in New England encompassing 30 acres, 20 miles northwest of Boston. DeCordova's mission is to foster the creation, exhibition, and exploration of contemporary sculpture and art through exhibitions, learning opportunities, collection, and a unique park setting. 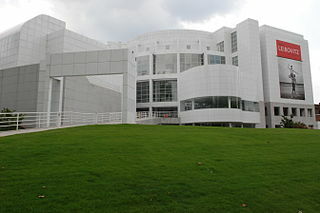 The High Museum of Art, located in Atlanta, is a leading art museum in the Southeastern United States. Located on Peachtree Street in Midtown, the city's arts district, the High is a division of the Woodruff Arts Center. Member, Artists Equity Association, Inc. The Louis Comfort Tiffany Foundation was founded in 1918 by Louis Comfort Tiffany to operate his estate, Laurelton Hall, in Cold Spring Harbor, Long Island. It was designed to be a summer retreat for artists and craftspeople. In 1946 the estate closed and the foundation changed its purpose from a retreat to the bestowing of grants to artists. After returning from Europe in the late 1940s, Polonsky began attending meetings to protest Boston's Institute of Contemporary Art, then known as the Institute of Modern Art. Bloom, Zerbe, Shahn, Jack Levine, had gathered to express their fears "that the Institute would ... become a showcase for ... something quite different that what we thought it ought to show and support," Polonsky said. Zerbe's experience with Boston's Museum of Fine Arts, which only "owned one watercolor, and at a time when his work was being acquired quite seriously, with pleasure, by some of the other institutions,"  stoked those fears. The meetings jumpstarted the formation of the New England Chapter for Artist's Equity. Jack Levine was an American Social Realist painter and printmaker best known for his satires on modern life, political corruption, and biblical narratives. The activist artists, all connected to the Museum School or the Boris Mirski Gallery, had become a loose art club of sorts; in that capacity, they also helped organize the Boston Arts Festivals. The original Festivals, in the 1950s and 1960s, displayed fine art in tents in the Public Garden, and provided free performances in nearby Boston Common. This represented a major change in how art was presented in New England. In the summer of 1947, Polonsky was a teaching assistant to Ben Shahn at the Museum School’s Tanglewood Program in the Berkshires. He subsequently traveled to France when awarded the Museum School’s European Traveling Fellowship upon graduation. Arthur is the subject of a documentary feature film called Release from Reason which is currently in production by his son, Emmy-nominated director Gabriel Polonsky. Arthur died peacefully of natural causes on April 4, 2019 in Newton, Massachusetts. He was married to artist Lois Tarlow from 1953 to 1983, who survives him. He is also survived by his three sons Eli, D.L., and Gabriel. Ben Shahn was a Lithuanian-born American artist. He is best known for his works of social realism, his left-wing political views, and his series of lectures published as The Shape of Content. Karl Zerbe was a German-born American painter. Esther Geller was an American painter mainly associated with the abstract expressionist movement in Boston in the 1940s and 1950s. She was one of the foremost authorities on encaustic painting techniques. The contemporary Boston Arts Festival is an annual event showcasing Boston's visual and performing arts community and promoting Boston's Open Studios program. The weekend-long Festival at Christopher Columbus Waterfront Park features a wide variety of arts and high-end crafts, including painting, photography, ceramics, jewelry, sculpture and live music. The Arts Festival, which has existed in several different forms, was relaunched by former Mayor Thomas Menino in 2003, then reconceived by Mayor Martin J. Walsh in 2015. The Beacon Hill Art Walk and Artists Crossing Gallery will be organizing the 2019 September Festival. Rico (Frederico) Lebrun was an Italy-born, Italian-American painter and sculptor. 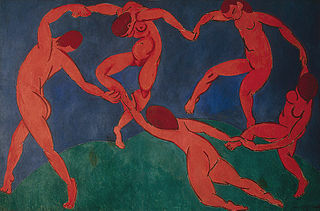 American Figurative Expressionism is a 20th-century visual art style or movement that first took hold in Boston, and later spread throughout the Critics dating back to the origins of Expressionism have often found it hard to define./ One description, however, classifies it as a Humanist philosophy, since it's human-centered and rationalist. Its formal approach to the handling of paint and space is often considered a defining feature, too, as is its radical, rather than reactionary, commitment to the figure. Kahlil G. Gibran, sometimes known as "Kahlil George Gibran", was a Lebanese American painter and sculptor from Boston, Massachusetts. A student of the painter Karl Zerbe at the School of the Museum of Fine Arts, Boston, Gibran first received acclaim as a magic realist painter in the late 1940s when he exhibited with other emerging artists later known as the "Boston Expressionists". Called a "master of materials", as both artist and restorer, Gibran turned to sculpture in the mid-fifties. In 1972, in an effort to separate his identity from his famous relative and namesake, the author of The Prophet, Gibran Kahlil Gibran, who was cousin both to his father Nicholas Gibran and his mother Rose Gibran, the sculptor co-authored with his wife Jean a biography of the poet entitled Kahlil Gibran His Life And World. Gibran is known for multiple skills, including painting; wood, wax, and stone carving; welding; and instrument making. Jason Berger was a Boston landscape painter, connected to Boston Expressionism. He painted from nature, en plein air, and used favorite motifs in abstract paintings, referred to as "studio paintings". He, also, enjoyed woodcuts which were predominantly printed in black and white. Known for his humor, love of jazz, and his upbeat approach to painting, “his work expresses the joy of life and love of place”. Gertrude Ann Youse, more commonly known as Gay Youse, was a painter, teacher, and gallery director. She spent most of her life making art prevalent and important to the Duxbury, Massachusetts community. Moving from Boston in the 1950s, where she had attended school at the Museum of Fine Arts, Youse was influenced by Austrian expressionist Oskar Kokoschka who gave a talk at her school and was exhibited in the Boston museum. Youse painted portraits and still lifes but was mainly known for landscapes. Barbara Swan (1922–2003), also known by her married name, Barbara Swan Fink, was an American painter, illustrator, and lithographer. Her early work is associated with the Boston Expressionist school; later she became known for her still-life paintings in which light is refracted through glass and water, and for her portraits. She is also known for her collaboration with the poets Anne Sexton and Maxine Kumin, and for her archived correspondence with various artists and writers. Dante Raphael Giglio, better known as Giglio Dante, was an Italian-born American painter. Bernard Chaet was an American artist; Chaet is known for his colorful, dynamic modernist paintings and masterful draftsmanship, his association with the Boston Expressionists, and his 40-year career as a Professor of Painting at Yale University. His works also include watercolors and prints. In 1994, he was named a National Academician by the National Academy of Design. Ture Bengtz (1907-1973) was a Finnish-American artist associated with the Boston Expressionist school, an influential teacher at the School of the Museum of Fine Arts in Boston, and director of the Art Complex Museum in Duxbury, Massachusetts. He also had a television show, "Bengtz on Drawing," on Boston's PBS station in the late 1950s. Lawrence Kupferman (1909-1982) was an American painter associated with the Boston Expressionist school in the early 1940s, and later, with Abstract Expressionism. He chaired the Painting Department at the Massachusetts College of Art, where he was known for introducing innovative practices and techniques. The Boris Mirski Gallery (1944-1979) was a Boston art gallery owned by Boris Chaim Mirski (1898-1974). The Gallery was known for exhibiting key figures in Boston Expressionism, New York and international modern art styles and non-western art. Mirski himself was known for supporting young, emerging and often Jewish-American artists. The gallery was at the center of Boston's burgeoning modern art scene in the 1940s, as well as instrumental to the birth and development of Boston Expressionism, the most significant branch in American Figurative Expressionism. ↑ "Arthur Polonsky". Kantar Fine Arts - Arthur Polonsky. Sep 23, 2018. 1 2 3 4 5 Brown, Robert (Sep 23, 2018). "Oral history interview with Arthur Polonsky, 1972 Apr. 12-May 21". Smithsonian Archives of American Art. ↑ Steiner, Raymond J. (Sep 23, 2018). "Artists Equity Association: A Look Back". Art Times: A Literary Journal and Resource for All the Arts. ↑ Bitely, Jessica (Sep 23, 2018). "Guide to the Boston Arts Festival Records: A Finding Aid" (PDF). City of Boston Archives and Records Management Division: Guide to the Boston Arts Festival records. ↑ "Harvard Art Museums". Harvard Art Museums. Sep 22, 2018. ↑ "Arthur Polonsky | College of Fine Arts". Boston University, College of Fine Arts. Sep 23, 2018.